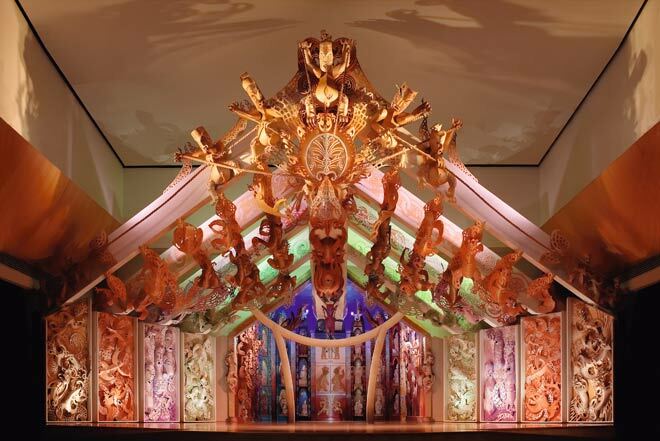 These carvings are on Te Hono ki Hawaiki wharenui (meeting house) in Te Papa museum. They show links to Hawaiki, the spiritual homeland from which the first arrivals to New Zealand came. Also shown are Māui (top) and his four brothers roping in the sun to slow its progress. In the early days the sun moved too fast across the sky, not allowing enough daylight hours for people to get all their business done. Māui convinced his brothers that they should plait strong flax ropes with which they could catch the sun as he rose. The sun was unfazed by the ropes so Māui beat him into submission with a jawbone gifted to him by his female ancestor Muri-ranga-whenua. Defeated, the sun moved more slowly across the sky from then on.